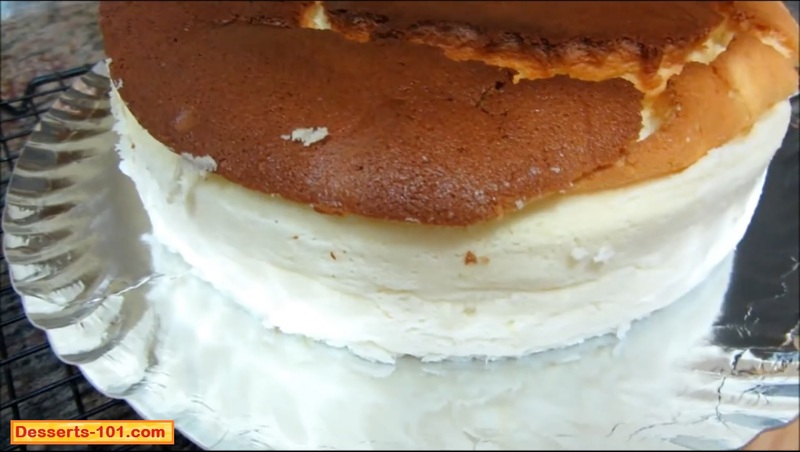 In my video on how to make The Best Cheesecake I showed a few pictures of the decorated cheesecake. It’s about time I explain how to do this. While I have no video on this, I hope you can follow my instructions and you too can enjoy The Best Cheesecake. 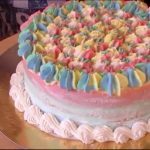 Swiss Meringue Buttercream – I like flavoring this with a little seedless strawberry jam. Toasted Coconut – Start out with sweetened coconut and toast your own. Seedless Strawberry Jam – You can always buy regular strawberry jam with seeds and heat it some and strain the seeds out. Preheat the oven to 325ºF/165ºC. Spread about 2 cups of sweetened coconut flakes on a baking sheet in a thin layer. Heat in the oven until the coconut start to turn a light brown color. Ever few minutes stir the coconut. Heating should take only a few minutes, usually 5 minutes but as long as 10 minutes. To the prepared Swiss Meringue Buttercream, add about 1/2 cup (125 mL) of seedless strawberry jam. Mix well to incorporate the strawberry jam. Do a taste test to see how you like the flavor, add more jam if desired. Fill a pastry bag with strawberry jam flavored Swiss Meringue Buttercream. Pipe of dab of buttercream on the center of the cake board and position the cheesecake on top. Using a pastry bag, pipe some icing on the sides of the cake and top and ice the cake smooth. 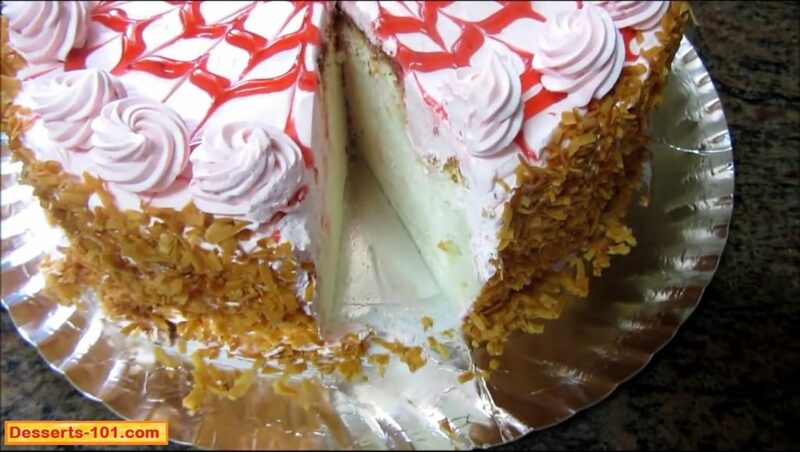 Add the toasted coconut to the sides of the iced cheesecake. Pour the strawberry jam into a clean bowl and still to mix smooth. Fill a disposable pastry bag with the strawberry jam. Snip off a small opening in the tip. Starting at the center, pipe the strawberry jam in a spiral shape. This is easiest to do if the cheesecake is on a turntable and you spin the turntable working from the center to the outside. Pipe rosettes around the cake as desired. Enjoy your Strawberry Best Cheesecake. 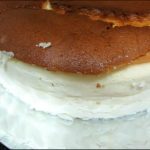 The Best Cheesecake after it has been decorated and is ready for serving. 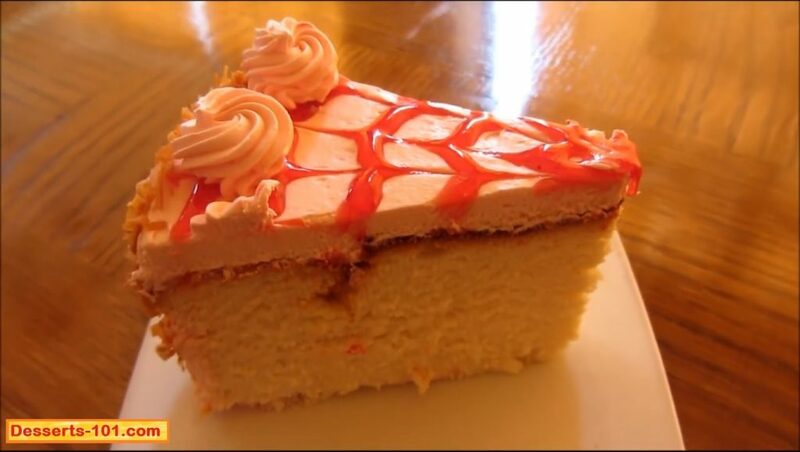 The Best Cheesecake with one slice removed. 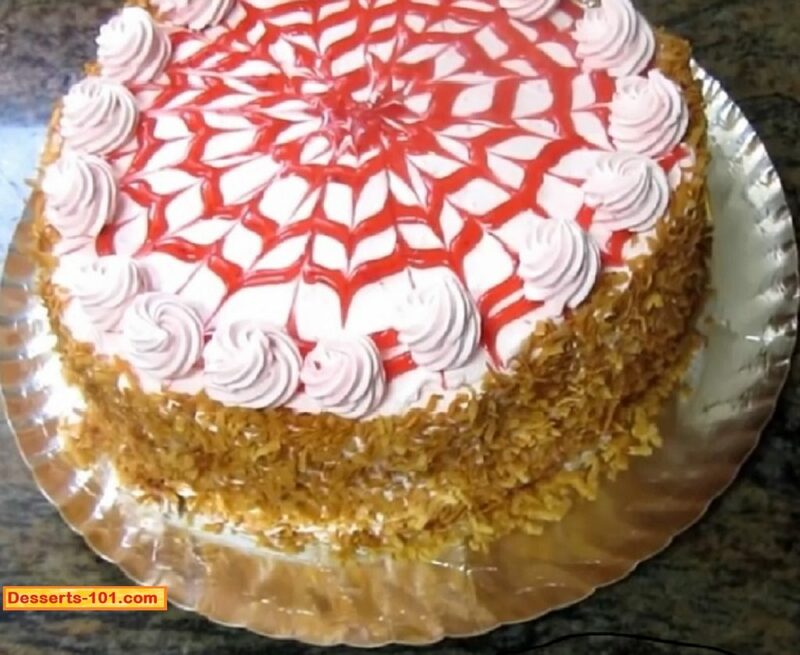 The Best Cheesecake is decorated with strawberry Swiss meringue buttercream toasted coconut and seedless strawberry jam. To the prepared Swiss Meringue Buttercream, add about ½ cup (125 mL) of seedless strawberry jam.